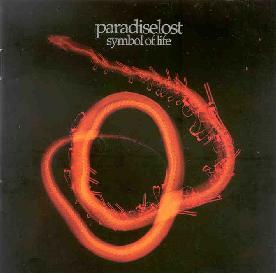 Paradise Lost - "Symbol Of Life"
Though Symbol Of Life is my introduction to UK band Paradise Lost, it is their eighth album since 1989. The promo sheet that came with the CD says the band started out as a doom/death metal band, but Paradise Lost have clearly headed into more Goth oriented territory, cranking out pounding Goth-metal rhythms with walls full of crunchy guitar chords and haunting piano melodies that seem to be a trademark of any Goth rock. And while Paradise Lost retain their metallic foundation, and do indeed rock hard, the slick production gives the music a "clean" sound that is miles away from anything doomy or death metal oriented. It's decent rock, and does get nicely headbanging at times, but it's a little too mainstream for my tastes and there's little variation from song to song. For more information you can visit the Paradise Lost web site at: http://www.paradiselost.co.uk.